For the last 75 years, Weaver Optics has dedicated their time and effort to making the hunting experience of every American memorable. This company has worked tirelessly to ensure that you have all the hunting equipment you need at a great price that reflects the value of your purchase. It is no wonder that Weaver Optics are popular among avid hunters. Recently, Weaver has expanded the Classic V-Series in order to include improved rifle scopes that offer better features. The 1-3X20 V-3 is just one of the newly introduced scopes, which features variable magnification and long eye relief for exceptional versatility and comfort for shooters and hunters alike. This low power Weaver model works well with rifles and shotguns, so that your close to medium range engagements are better than ever. Looking to expand your collection of rifle and shotgun attachments, then this review is perfect for you. When you are buying a riflescope, it is crucial that you opt for a scope that has been sturdily built. Otherwise, your scope will be damaged by unfavorable weather or terrain, and your investment will be flushed down the drain. The Weaver V-3 scope is designed using rugged one-piece tube construction, with aircraft-grade aluminum alloy forming the 1 inch tube. This is then finished off with a matte black coat, which guarantees that you are sufficiently camouflaged as you hunt. Furthermore, the tube of the riflescope is nitrogen purged, in order to eliminate internal fogging at all temperatures. All in all, the Weaver V-3 scope is waterproof, shockproof, and fogproof, making it the most dependable scope for your long-term hunting needs. Another exceptional feature of the Weaver riflescope is its optics, which I am happy to say are very clear and efficient. The Weaver V-3 has fully multi-coated lenses, which optimize light transmission so that you have perfect edge-to-edge clarity. These lenses guarantee that you have a crisp and clear image of your target, and that glare on your lens is reduced. Furthermore, the riflescope has a Dual-X reticle type, which allows for 1/4 inch adjustments at 100 yards. Accuracy is undoubtedly one of the most important features in a riflescope. In the case of the you have 1/4 MOA windage and elevation adjustments, which have an audible click so that you know when you have made an incremental adjustment. Accuracy is also amplified by the fact that the Weaver is parallax free at 100 yards, so that your focus is not disrupted as you shoot. Lastly, the is composed of a generous 3.7 inches eye relief, so that you can quickly get off shots without sacrificing precision. Field of View determines how well you can see your surroundings when you look through your lens. The scope’s Field of View at 1000 yards is extremely respectable- it is 870 feet at 1x magnification, and 307 feet at 3x magnification. This ensures that your game will never catch you unaware. Q: What are the specifications of the Weaver 1-3X20 riflescope? 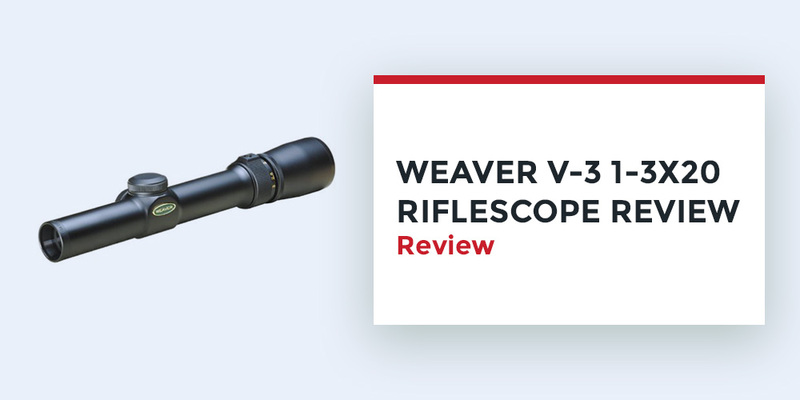 A: The Weaver V-3 scope has several features aimed at improving the function and performance of the scope. These specifications include the following: 1-3x magnification, 20mm objective lens diameter, 1 inch main tube diameter, 79mm eye relief, 1/4 MOA impact point per Click, 15mm exit pupil diameter at 1x, 6.6mm exit pupil diameter at 3x, and 120 inch maximum elevation and windage adjustments. Q: What are the brightness specifications for the scope? A: The Weaver riflescope has a relative brightness of 225 at 1x magnification, and 43.6 relative brightness at 3x magnification. However, if you are using the scope in low-light conditions, then the twilight factor is 4.5 at 1x magnification and 7.7 at 3x magnification. Will I get tired carrying the scope while hunting? The size and weight of any riflescope is important, as it determines whether or not you will feel fatigued from carrying around the scope. Thankfully, the Weaver V-3 measures 9.1 inches in length, and weighs 0.53lbs. This means that the scope will not weigh you down. The Weaver V-3 has been designed with generous eye relief, a large field of view, and quick power adjustments, so that you can acheive maximum versatility as you go about your hunting. 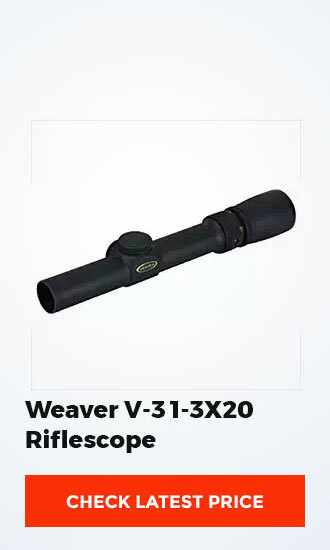 Whether you are looking to hunt first thing in the morning, or late in the evening, this Weaver scope will take care of all your shooting needs.